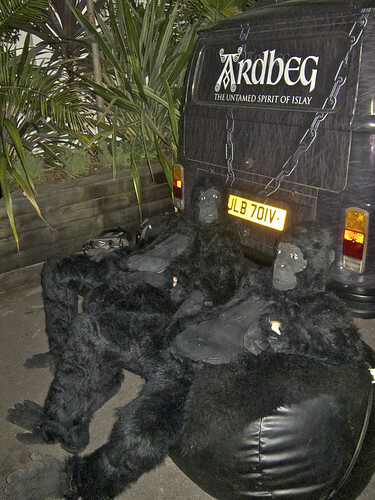 Ardbeg is a bit of a strange distillery. They’re small but scarily well known, with fanatical fans (although I suspect that’s a tautology), scarily high prices for some of their bottlings and the backing of a big corporate. I’ve only recently started learning about them and haven’t really tried any of their whiskies since I first encountered the brand a few years back at a whisky evening around Adam‘s house – he’d gone on their website, joined their members club (The Committee) and accidentally ordered one of each of the whiskies they had available. An expensive accident, but one that kept us happy with a range of whiskies covering their entire production of the time. Ardbeg’s had a spotty recent history but started officially started out in 1815, distilling on Ardbeg farm on the south coast of Islay. They produced whisky right through until the start of the 80s, when production started to slow until the distillery was mothballed in 1981. Allied Distillers, owners at the time, also owned Laphroaig and felt they had enough ongoing production from there, along with stored whisky from Ardbeg to meet their needs. It started producing small amounts of spirit again in 1989 but closed its doors seemingly finally in 1996, after several years of uncertainty. Allied put the distillery on the market, to great interest, with Glenmorangie buying it and reopening production in 1997. In 2004 Glenmorangie was acquired by the LVMH group (Moet Hennesy – Louis Vuitton) and Ardbeg went along as part of the package, giving it a big corporate backing. Glenmorangie and Ardbeg are generally left alone by the group, although they do get the backing money needed to push their increasingly well known brands. In addition they pool their technical resources, with Glenmorangie’s Bill Lumsden also acting as Ardbeg’s master distiller. 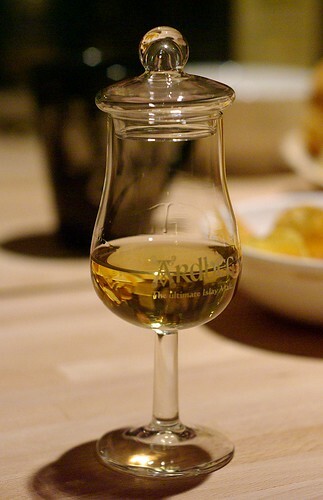 The whisky’s style is quite simple – very peaty. Using malt peated to 50ppm they are one of the peatier on the island and they relish in this distinction, pushing themselves as a peat lover’s dram. He is directly or indirectly connected with the dilution of any dram of Ardbeg Islay Single Malt Whisky with any substance other than water. I recently joined The Committee having heard that they were holding their 10th anniversary celebrations. I’d not tried any of their recent bottlings, but had a sample of one of their new releases and had been occasionally delving into SWMS bottlings when they appeared, so didn’t feel too bad about jumping on a free drink bandwagon a little late. The celebrations also showed me how they’ve upped their game online – the venue for both Edinburgh and London parties was revealed slowly via cryptic clues on twitter, with a goody bag going to the first person to guess – annoyingly I didn’t have enough of a clue to even guess the London location and was about 2 minutes walk away with my guess as to the Edinburgh one. In the end the London party was held at The Worx, on Heathman’s Road, near The White Horse in Parson’s Green (from the clues: ‘on the Ardbeg tube line’, ‘down south, however didn’t dare cross the river’, ‘Wretched Rector after a bumpy sail through Corryvreckan‘, ‘Poor Shortie [the Ardbeg dog and mascot] nearly got trampled by a fair stallion on the way’, ‘where the peat cutters of the heath reside’…obvious once you know the answer). The format of the evening was simple – turn up, have a cocktail and wander around the venue playing fairground games (I won a nice cashmere scarf on the hoop-la), eating food and drinking copious amounts of whisky. The initial cocktail of the evening was simple and remarkably effective, especially as peaty whisky is a very difficult thing to mix effectively (and that act against paragraph 17, above). 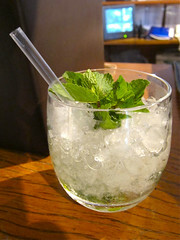 It was a combination of Ardbeg 10, crushed ice, simple syrup and bruised mint leaves. It was a bit like a sticky mojito with a slab of peat, but was also very refreshing and a great palate cleanser. On the bar they had a selection of Ardbeg whiskies and I started off with the Ardbeg 10. On the nose there was a touch of acetone with the inevitable peat, along with a strong alcoholic sweetness, a touch of woodsmoke and some butterscotch. To taste it was buttery with a sweet orangey peatiness and coal dust. Water dropped out a lot of the sweetness, compacted the coal dust into briquettes and brought out a woodsmoke finish. Not a subtle dram, but a good smoky, peaty whisky for those who like it quite sweet. Next I tried the Rollercoaster, the most recent Committee bottling, bottled for the 10th anniversary, and one that won’t hit the general public because it’ll sell out before it has a chance. It’s a vatting of 10 casks, one from each year between 1997 and 2006 – Chris and Lucas have a complete list of the casks over on The Edinburgh Whisky blog. This was the one that I was most wanting to try, as I suspected it’d disappear before I got another chance. On the nose it had sulphur, sea salt, sea weed, oranges and a very hard edged peatiness, almost stony. To taste it had wood ash, eggs, more stony peat, coal smoke and a smokey sweetness. A bit of water toned everything down a bit and brought out more sweetness, with a hint of smoky bacon and sweet butter. I really rather liked it and have worryingly found that you can still buy it from the Ardbeg shop. I must resist. Next I went for the Corryvreckan, another former Committee bottling that was brought in to replace Airgh name Beist, their previous top cask strength whisky. On the nose it had the BBQ chicken smell that I’m starting to think is my brain’s interpretation of woody wine/sherry influence, as well as white sherry, eggs and sea weed. To taste it was spicy with apples, burnt toffee, raisins and a lingering smoky peaty finish. Another good’un and one that deserved its win as best single malt whisky in this year’s World Whisky Awards, as well as numerous other gongs. Finally, as I’d missed the last of the Supernova, Ardbeg’s super peaty whisky, that they had on the bar, I went for the Blasda. This one was described to me as “a lady’s dram”, with only 20ppm of phenols in the malt and a move to a lighter style. On the nose it was light and sweet with a hint of fruit that might have been cherry. To taste it was buttery and prickly, with sour peat and red berries. Most of all it was surprisingly light for a peaty whisky, especially an Ardbeg, even though this is the intention. Water brought out both cream and a bitterness from the wood as well as touch of cardboard and some struck matches. An interesting experiment, but not one that really grabbed my attention. Overall it was rather a good night, although the free flowing whisky (there were tokens for some drinks, but by the end of the night the giant bottle of Rollercoaster they had on a smaller bar was being tipped into any glass that came near) meant that there was some drunkenness. If Jerry, the nice Glaswegian chap who tried (unsuccessfully) to teach me some Scottish toasts, is reading this then please drop me an email – I owe you a beer or two and I have the glasses you won, you left them in the pub. Yes, there was a pub after, which was probably a mistake. Some gorillas. It was safer not to ask. While I may have missed the previous release of Supernova, I added a sample of this year’s one to my most recent Master of Malt order and thought I’d add it on the end here. Supernova is intended to be the peatiest whisky that the distillery produces, using 100+ppm malt, and the last release had a hint of the Marmite effect to it – many people didn’t seem to rate it, but those who liked it really liked it. After the success of the last bottling they’ve rolled out a new one for this year – Supernova 2010. It’s pale gold and has no age statement, but with the intensity of flavour I would guess it has a good range of whisky in it. On the nose it has (as expected) lots of peat, along with salted butter, fresh mulch and some wet grass. To taste it’s spicy and every bit of its 60.1%. It starts with a big burst of sherried caramel sweetness and then moves through coal dust to a bitter burnt wood finish. In the middle there’s a bit of a fizzy citrus flavour which the chaps at Master of Malt describe as being like Starburst chews. I see what they mean but a) still reckon they should be called Opal Fruits and b) reckon that the flavour is more like fizzy orange and lemon Chewits. Water kills a lot of the bitterness as well as bringing out more of the fizzy fruit. This release has generally been considered inferior to the last one from what I’ve read, but as I didn’t get to taste the old one I can only assume it was really good (it does now change hands for about £125 a bottle) – I rather liked this one, with its peatiness being mellowed, but not too much, by some of the younger flavours and with a depth that I didn’t necessarily expect. I’ve had the scotch w/simple syrup & mint at Callou (sp?) Callay (east London near the office), although not w/Ardbeg. It’s a VERY good cocktail. Also, Laphroig has a very extensive members club (“Friends Of Laphroig”) and a members room as well (I took advantage of it while I was out there). In general, I prefer Lagavulin over Ardbeg (how can two distilleries so close together taste so different?) but was impressed w/their flavors when I tasted at the distillery. I’ve been a member of the Friends of Laphroaig for a few years (and have a couple of bottles of Cairdeas to show for it), but the committee are a little more forthright and active. Scarily so.